Calssara is a cosplay girl from Germany who loves to cosplay since 2004. She was Germany's representative for World Cosplay Summit (WCS) in 2009 and 2011. 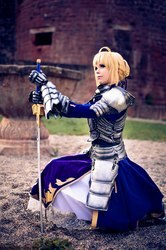 Also she represented her country in the European Cosplay Gathering (ECG), one of the biggest European cosplay competitions that takes place in Paris on Japan Expo, and won the champion title in 2012 for her country with her Saber costume from Fate/Stay Night. Calssara visited already 15 countries (Belgium, Denmark, Finland, France, Germany, Hungary, Italy, Japan, Mexico, Netherlands, Norway, Portugal Spain, Turkey and Romania) on 3 continents with her costumes as cosplay judge, panelist and messenger. In real life she is a librarian, event manager and passionate tea drinker. She is a very social and happy person who loves to meet new friends and supports cosplayers all over the world.